Looking to change up your traditional Thanksgiving dinner this year? 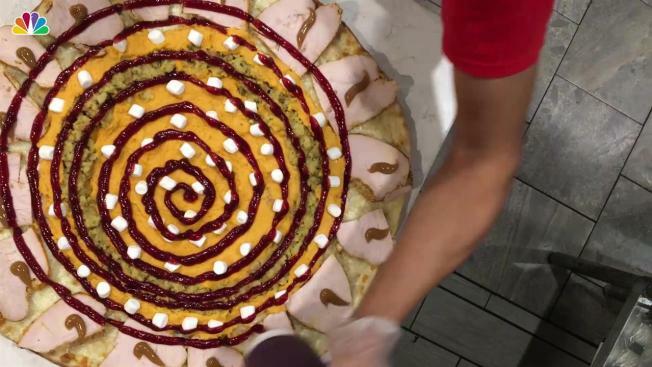 At Krave It Sandwich Shop and Eatery in Bayside, New York, you can get a full three-course Thanksgiving meal on top of a cheese pizza. The pizza, named the ‘Cran-Slam’, is a traditional mozzarella pie topped with mashed sweet potato, marshmallows, stuffing and turkey. It’s then finished off with gravy and cranberry sauce swirl. The Cran-Slam is available by the slice for $5, or buy the whole pie for $40. It will be sold in-store for the week leading up to Thanksgiving.